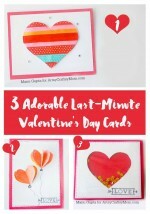 Love is literally in the air with this cute Quilled Paper Valentine Heart Balloon Card! With clouds & a heart shaped balloon, this is great for a classroom. Have you heard of the saying “Love is in the air”? Of course you have! You can’t avoid it, especially this time of the year – the Valentine season! And it’s particularly true as soon as we hit mid-January, all the way to the 14th of February. The world suddenly takes on shades of pink and red, and there are hearts, teddy bears and special treats in abundance in stores. You have to admit, there’s a lot more than love in the air! 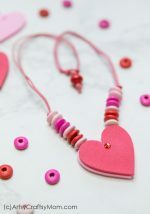 However, we’re taking that cliched saying literally today, with a Quilled Paper Valentine Heart Balloon Card that features a heart shaped balloon floating mid-air. This is going to be a Valentine’s Day card that your special someone can’t resist! 1. 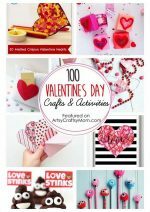 Select card stock for the heart, clouds and the balloon basket. Trace the template patterns on the selected papers and cut them out using scissors. 2. 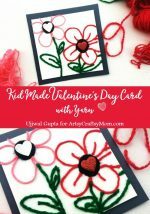 Use an x-acto knife to cut strips from the selected card stock. Keep the width about 0.75 cm for all colors although the length will vary. Cut out 8 cm strips for the clouds and 16 cm long strips for the basket. For the heart cut out 2 strips of 25 cm length. 3. 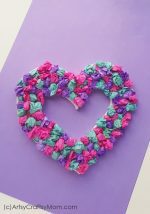 Prepare 2 big teardrop quilled shapes for the heart cut out and stick them as shown in the image above. 4. Prepare loose coils using the white strips (for the clouds). Glue the coils on the cloud cut out. Try to fill the clouds with as nicely as you can. 5. For the basket you will need to prepare 4 teardrop quilled shapes. Simply glue the 4 quilled teardrop shapes on the basket cut out, keeping the pointy side of all 4 shapes adjacent to each other, pointing towards the middle of the top edge of the basket. 6. Prepare the base card from a sheet of card stock paper and gather all the quilled items from the previous steps. 7. Attach the quilled items on the front side of the card. Glue the quilled heart right on the top side of the quilled basket, keeping about 2 cm gap between both items. 8. Use a black marker to draw strings between the heart balloon and the basket to connect them. How cool is this Valentine’s Day card? I can think of all kinds of lines to add to the inside, ranging from cheesy to cute (although there could be an overlap!). 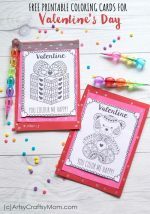 You might also like these printable Valentine’s Day cards, a Valentine’s Day card with yarn, a Tic Tac Toe card as well as some last minute Valentine’s Day cards. Looks like you’re all set to impress your Valentine this year! « 6 Tips to make time for reading for both Busy Moms and Kids! Thank you for this! I always did Quilling free form without gluing the quills to cardstock tamplates and they were pretty, but not as precise as this! Also I used a pastel blue under the white quills for the clouds so some color would show through giving the clouds a little pop.